The term “Millennial” covers a vast age group of adults ranging from college age to mid-thirties. This huge generation of 81 million people are interested in purchasing homes, however, they’re not ready to buy just yet – they’re waiting longer to to commit to buying a house. They have a tendency to shop rentals while shopping homes to buy. Renting enables them to wait longer to buy while addressing affordability and availability issues in the housing market. As Baby Boomers stay put in their family homes, the availability for suburban single-family starter homes dwindles in availability. Millennials are also waiting longer to commit to marriage or start a family, which usually precipitates buying a home. They tend to have larger amounts of student debt, making it difficult to receive a mortgage loan approval. They know homeownership can be expensive. In competitive markets, rentals are much more affordable. Millennials are more interested in having a convenient and safe place to live, rather than investing in a long-term commitment. Renting results in minimum financial responsibility, while offering the freedom and flexibility of an easy relocation. They are more willing to spend their hard-earned dollars on experiences rather than possessions. Their priorities are much different than generations before them. This age-group prefers contributing to their retirement and investment funds or saving up for a special vacation over being tied down to a house in need of money and attention. They recognize that homeownership is costly and can be quite tedious. Buying a home ties them down to a 15 or 30-year commitment. With that commitment comes the responsibility of maintenance and repairs. They’d rather stay free of this undertaking and save up those greenbacks. They’re also showing a tendency to skip a step in the life process. 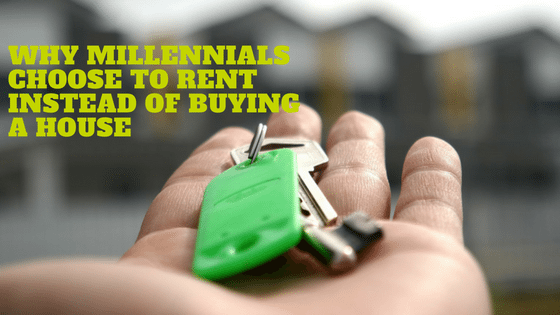 This generation tends to skip over the purchase of their first starter home. By waiting longer, they’re able to save money while they continue to rent. On average, they’re renting 10-15 years longer than generations before them. When they do finally make a home purchase, they’re buying larger, more expensive homes, not the traditional cookie-cutter starter home. Millennials are dealing with lower incomes, higher educational debt, limited permanent employment offering, adequate wages, and insecure structure and economy. They’re more economically and socially aware than generations before them. The internet generation has been raised to educate themselves and be patient. Renting enables them to pay off their debt, save up their funds, and wait on the opportunity to find that perfect home. Many Millennials feel right at home in an apartment community like that of Sugarloaf Luxury Apartments because it feels like home, and the community itself is inviting.